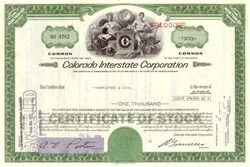 Beautifully engraved certificate from the Colorado Interstate Corporation issued in 1972. This historic document was printed by the American Banknote Company and has an ornate border around it with a vignette of an allegorical man and woman sitting on both sides of the company's logo and a globe. This item has the printed signatures of the company�s president and treasurer and is over 28 years old. In the late 1920s, when the natural gas industry was first emerging, Colorado Interstate Gas Co.(CIG) was formed as the result of a transaction between three companies for the purpose of moving natural gas from the Texas Panhandle to Colorado's Front Range. One company had natural gas leases; another had the markets; and the third had the money and the know-how. The result was the Canadian River Gas Company, which produced the gas, and Colorado Interstate Gas Company which purchased and transported it. In 1951, Canadian River merged into CIG and, twenty years later, in 1972, CIG became a wholly owned subsidiary of The Coastal Corporation, a Houston-based energy holding company. CIG's original pipeline was one of the first large diameter natural gas transmission lines in the United States. At 500 miles long, it was also among the longest lines in the country. CIG officially began service on June 1, 1928, and on June 19, the first CIG gas reached the Rocky Mountain Steel Mills in Pueblo. A few days later, on June 22, the long awaited and much publicized gas reached Denver. Prior to its arrival, natural gas had to be produced by baking coal at considerable cost. Now with a readily available supply of gas at a reasonable price, Public Service Co. of Colorado, which held the rights to distribute natural gas in Denver, could actively promote its use in the home, first for cooking and later heating. Within five years, natural gas use more than tripled in the Denver area. Although CIG's main offices were located in Colorado Springs from the beginning, natural gas did not come to that city until 1930. Today, CIG's transmission system delivers natural gas from Texas, Oklahoma and Kansas, as well as Utah, Colorado, Wyoming and Montana, to utilities and industrial customers along Colorado's Front Range, from Cheyenne, Wyoming to Raton, New Mexico, and to cities in eastern and south central Colorado. CIG also transports natural gas to other pipelines, which deliver it to markets throughout the country.